Summers are busy around here, and I haven't had much time to work in my studio lately. If I don't get my art fix, I get pretty crabby, so I've had to make away from my studio. I've been channeling all of my creativity into my sketchbook, which comes with me everywhere I go. Care to have a look inside? A stars & stripes themed sketchbook drawing that I finished on the 4th of July. Stripes have been popping up in my sketches lately. I like the way they play against the organic forms that I naturally draw. The finished version of a sketch that I started and abandoned earlier this year. A ballpoint sketch in an elegant emerald green. I'm usually really drawn to the yellow-green pen my set of 8 Bic Crystals, but this emerald green was calling to me. There's a real elegance to this color that I'm totally digging right now. You'll probably see more in this color soon. 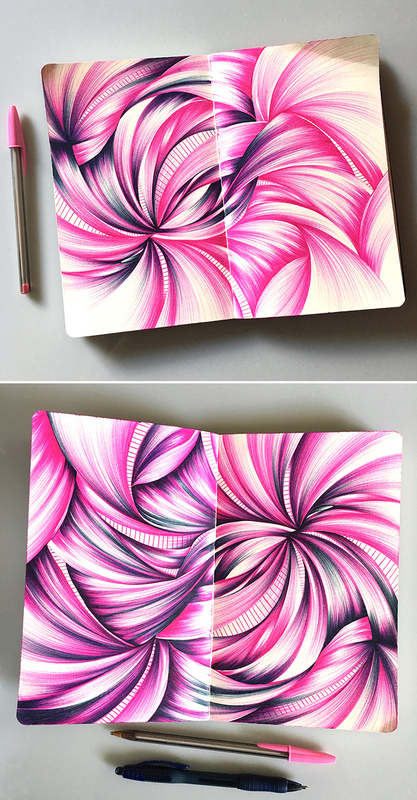 Adding a little pop of pink really brought this sketchbook drawing to life. I decided to use pink sparingly in this composition. I like how it adds a little variety to the composition, instead of it being the same all over. I'm planning on designing a 2018 calendar and you'll most likely see some of these sketches as backdrops for the pages. Stay tuned my friends. If you're fond of my sketches do head on over to my shop. I've made a small collection of prints from my most favorite sketchbook pages. I'd be happy to make one special for you. Just get in touch! Newer PostComing Soon: An Online E-Course!